In 2012 my favorite television show was Parks and Rec. For the first four seasons, the show was appointment television. Every Thursday, it would come on, and I would be on the couch, ready. Then season five came around. In the first half of the 22 episode season, there was only one instance when the show aired more than two weeks straight (the first three episodes). I’d tune in one night, it’d be on, and the next week it was nowhere to be found. It became impossible to say whether or not a new episode was going to air, so I stopped tuning in. I’ve still never made it past season five. What does all of this have to do with editorial calendars? Well, not much directly. But the impact NBC’s erratic broadcast schedule had on me is a perfect illustration of the importance of consistency in the release and broadcast of content. If you are a content creator—no matter if you’re creating sitcoms for an audience of millions or a blog for an audience of hundred—cadence and consistency is key to keeping and building a following. If you have a blog or website, an editorial calendar is a great way to ensure you are consistently publishing and not disappointing—and ultimately losing—your audience. Think about a blog you visit consistently. Chances are, when you go to the page, you expect to see new content. And, since you’re visiting consistently, chances are the blog doesn’t disappoint. I’d be willing to bet the blog you’re thinking of has an editorial calendar, and it sticks to it like an ethical doctor does the Hippocratic Oath. An editorial calendar is a simple concept. It’s a calendar used by content teams to plan the production and publishing of content. A good editorial calendar will have a backlog of topics that writers can select from to write about. This prevents your editorial team from falling behind and getting to the point where publishing gets off schedule because writers have nothing to write about. Need help generating blog ideas? Read this for some tips on how to generate blog content ideas. In addition to a backlog of ideas, it should contain a schedule. The schedule should include everything from when pieces are to be published to when the writer should start working on them. For example, let’s say you have a tech blog, and one of the stories in your backlog is about how augmented reality will impact the coming generation. There should be dates for when the first draft will be finished, when the first round of edits will be finished, when the edits will be implemented by, when the piece will be prepped for publication, and finally when the piece will be published. 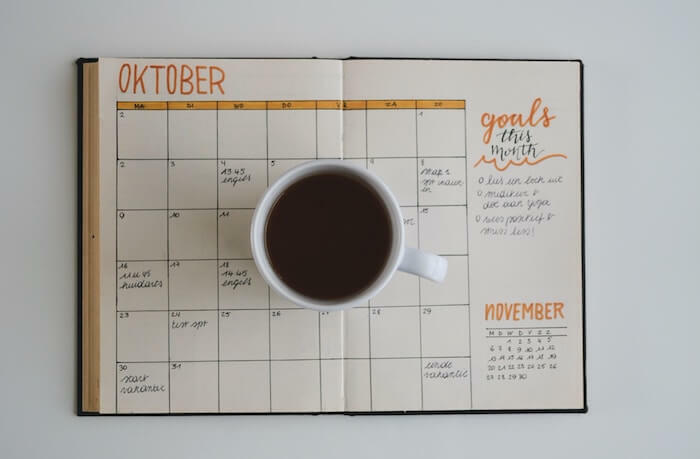 Of course, these dates will differ depending on your editorial process, but the point is to have each component of your publishing process planned out. If you do this successfully, you will know when things are falling behind and easily be able to rectify the situation. There is no one right way to create an editorial calendar. Here at ActiveCampaign, we use a spreadsheet, and it works great. We have a small team, and there’s no reason to overcomplicate things. Included in the spreadsheet is a backlog of blog ideas, a schedule for the next five weeks’ worth of blogs, and their publication dates. It’s a little bare, but it’s perfectly-suited for our team and keeps us on track. However, if you have a content team that rivals the size of the New York Times newsroom, an Excel spreadsheet likely won’t suffice. If this sounds like you, it’s probably worth getting a tool that is a little more powerful and dynamic. Project management and task management tools can serve as great editorial calendars. Products like Trello, Asana, or Goodday all allow you to keep a backlog of ideas, topics or tasks as well as set deadlines and move things through different stages. It’s probably a good idea to have one person on your editorial team own the editorial calendar. This will prevent confusion or multiple entries. It’s important to nail down a process for managing your calendar because if everybody is not using it correctly, it can quickly become useless. When implemented properly, your writers and editors will have to worry less about logistics and can spend more time doing their jobs. Having said all that, get to writing… and scheduling.